Heat oven to 425°F. Lightly spray rimmed baking pan with cooking spray. In medium microwavable bowl, place cauliflower and water. Cover; microwave on High 6 minutes; drain. In small bowl, mix 2 tablespoons of the melted butter, the garlic powder and salt; pour over cauliflower in bowl. Carefully stir until coated. Sprinkle with cheese; carefully stir to coat. Arrange in pan. Bake 15 to 18 minutes or until cauliflower is tender and lightly browned in places. Meanwhile, in 8-inch skillet, heat remaining 2 tablespoons melted butter and the bread crumbs over medium heat. Cook 6 to 8 minutes, stirring constantly, until golden brown. Remove from skillet. Stir bread crumbs into cauliflower, and serve. Toasting the panko bread crumbs with butter in a skillet produces a very crunchy result. 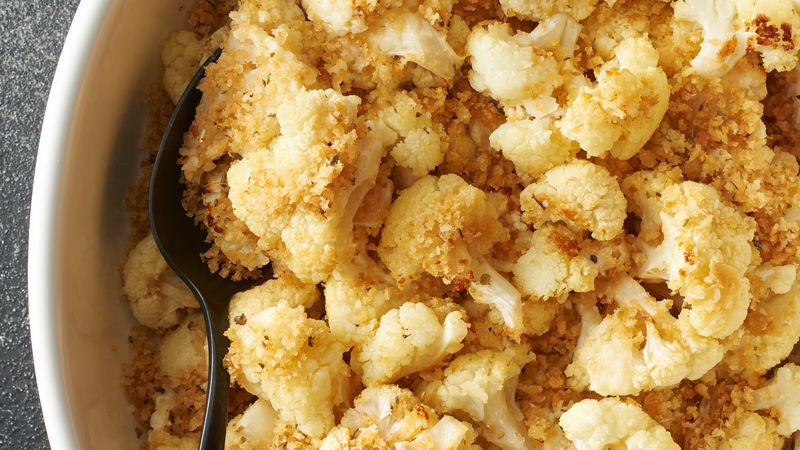 Partially cooking the cauliflower in the microwave before roasting shortens the oven time and results in a crisp-tender texture.